According to the folks who watch the weather, this past summer was one of the hottest on record. When was the previous record set? That would be last summer! Fall has arrived and the air conditioners are being switched off all around Charlotte but you might want to think about keeping those ACs off permanently. While it is true that you get a kind of instant rush from the heat outdoors by stepping into an AC cooled room, long time exposure to the kind of closed environments created by an AC controlled room could be bad for your health. There have been studies conducted which found that people living in buildings with central AC are more susceptible to airborne diseases than those living with natural ventilation. That’s because once a germ particle gets into a room with an AC it has nowhere to go but to swirl around that room beginning breathed in and out. Why do you think so many people get sick on a five hour airplane flight? They’re stuck with the germs. “But what about the heat?” you might ask. To prepare yourselves for next summer, you could install a couple of ceiling fans. These are terrific alternatives to air conditioners and offer quiet, cool air that is circulated throughout the room. Best of all you can keep your windows open for a fresh breeze. A ceiling fan will greatly reduce your electric bill. You’re sure to appreciate those savings a lot more than a temporary cool down from an AC. Staying cool really isn’t all that complicated. The best thing you can do is to keep drinking water. Add a slice of orange or lemon to for a splash of flavor. Having a cool towel wrapped around your neck is also a terrific way to beat the heat indoors. All of these options can present a better alternative to AC use. 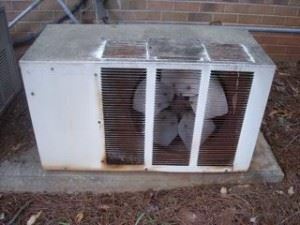 If you’re ready to kick the habit then you’ll need to get rid of that old AC. To do that you only need to make a single call to Junk King Charlotte. Even if you want to swap out the AC for a more energy efficient model that has stronger air filters you’ll still want to call Junk King Charlotte for the disposal duties. An air conditioner is not something you can simply toss out with the kitchen garbage. Thankfully the Junk King crew will be able to pull your old unit out of the wall and carry it off to their truck without much of a hassle. As an added bonus, that same Junk King crew can cart off any other junk item you want to get rid of and yes, they’ll carry those out as well! This entry was posted in Air Conditioner Disposal, Charlotte Appliance Disposal, Charlotte Junk Hauling, Charlotte Junk Removal and tagged Charlotte Air Conditioner Disposal, Charlotte Appliance Disposal, charlotte hauling, Charlotte Junk Removal on September 27, 2012 by Terendius David. Last updated August 2, 2017 .